When you're done watching the video, you should head out to LearnXNA to see a bit of the community. Woo, first post! More XNA videos would be great, its an exciting platform and there just isn't enough content for it yet. ﻿Woo, first post! More XNA videos would be great, its an exciting platform and there just isn't enough content for it yet. Wohoooo. Can't wait to watch it. Thanks dude. Something about XNA Express and Vista in this video? As a user of XNA and XNA GSE since Beta 1, all I can say is that it totally kicks buttay. If my hunch about what rodawgg will show in the second video, some of you might be amazed at just how powerful and capable XNA is. There's already a pretty strong community behind it to. Just keep your eyes open as I'm sure it will really start to blossom as time passes. I'm hoping that the coming of XNA will lead to some _very_ interesting experiments in game play mechanics and game types, just like some of the innovation we saw come out of the first Shareware push in the 80s. Plus, come on, you can see your own code run on the 360! 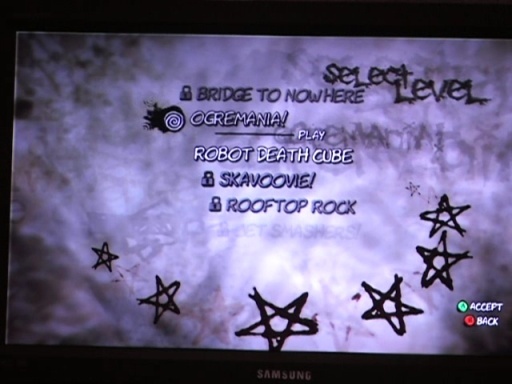 Writing your own 360 games using XNA, how cool is that? When do we get the Xna Express for Vista? Or what are you running, Jason? Are you running it on XP? Boyd mentioned that in order to use XNA, and write code on your 360, you would need to know C#. Is that exclusively the XNA favored language? Or will VB guys like myself be able to play in this parkt too? Look around 8:30 into the video... I'm not sure how to describe it, but Rory's expressions are beyond hilarious. Sad that it's not easy to create a 2D sprite game... I mean it would be cool to do something as a start... Perhaps somebody from the team could point me to resources on sprite games done with XNA... if there are any. ﻿Sad that it's not easy to create a 2D sprite game... I mean it would be cool to do something as a start... Perhaps somebody from the team could point me to resources on sprite games done with XNA... if there are any. Actually littleguru, it's very easy to create a 2D sprite game in XNA (especially with Beta 2 now that the content pipeline has been added). I just finished up a Tic-Tac-Toe game with no problems. The one feature of the framework that isn't there (and I'm not sure what plans are there to support it) is font support. There isn't an API currently in XNA Beta 2 to simply pass in a font name and draw a string with that font at a given location. If you want to draw strings on the screen, you will either be building your own bitmap-based font engine, or using an existing one that someone else has built (look for XNAExtras). There are several sites that have online tutorials you can follow. Rory of course mentioned http://learnxna.com/default.aspx. 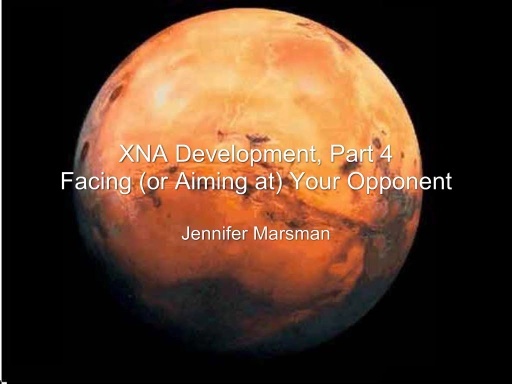 However, another one that a friend of mine put together is http://www.xnadevelopment.com/. As most things managed game development with the MS technology stack, keep an eye on http://www.thezbuffer.com/ for news regarding XNA. ﻿Actually littleguru, it's very easy to create a 2D sprite game in XNA (especially with Beta 2 now that the content pipeline has been added). I just finished up a Tic-Tac-Toe game with no problems. More great news. The only problem that is left now, are my great decent quite ok not that good bad graphic skills... I was thinking to buy a graphics pad to do some painting that I could use for my first game. What do you people think? What's the best for drawing sprites? I have Visual Studio Professional installed... Now the setup is telling me that I can't install XNA Express Edition Are there some command switches to disable this check and install it anyway? I found this, if anybody else is encountering the same issue. ﻿Boyd mentioned that in order to use XNA, and write code on your 360, you would need to know C#. Is that exclusively the XNA favored language? Or will VB guys like myself be able to play in this parkt too? Who knows... maybe this means that in 6 months you'll be an ex-VB guy. X-Men vs. Street Fighter is awesome! I'd really like to get into game development, but unfortunately I'm the laziest person you'll ever meet. So it's been difficult to get around to it. I've just picked up Beta 2 yesterday - and I've already made a little flying 3D spaceship! Cool. Oh sure, send them to LearnXNA instead of my XNA development site....geesh. After all I've done for you Rory? LOL! 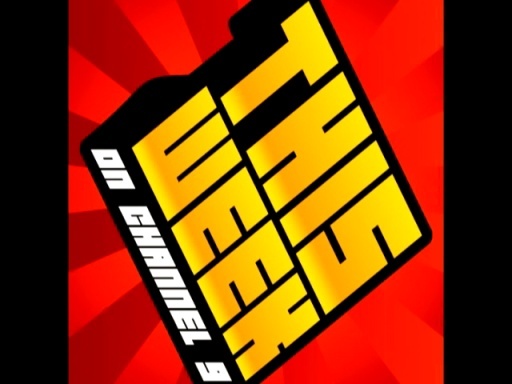 I'm so excited that you did this video, you're rocking the Channel 9 hizouse! Need me to type up any email addresses for you sometime? I wish this sort of thing existed back when I was trying to make games in QuickBasic. Everyone has it easy today. Hah, those were the good old days. Using those CLS commands way too much, trying so hard to figure out what CHR's the arrow keys were, and of course, playing Gorilla and Sammy the Snake! Those days paved the way for me being able to code what I can in XNA these days. Can you include the transcripts from the video? I'm hearing impaired. just so the crew knows, i like the new host. it's nice to have someone younger. but nothing against you, charles. For 10 years I've been a business-oriented developer because that's where the money is for me. I've written maybe 2 small, beginner-level apps (not games) using DirectX. XNA may be enough to turn me into a hobbyist game developer. Rory, you rock!!! This is a great thing for Channel 9!!! How much of the .Net framework is supported in broad terms? .Net 2.0, 3.0 compatibility? 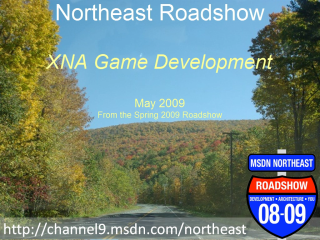 The XNA Framework is included with XNA Game Studio Express and it is the set of managed (.NET) libraries based on the .NET Framework 2.0 that developers use. Will you be able to make networked games - ie remote multiplayer? Q: Do we have network or Xbox Live access on the Xbox 360 via the XNA Framework? A: On Windows you can use System.Net or any other network library. On Xbox 360 there is no network support. Local multi-player support is supported on the Xbox 360 however. Eventually, you’ll be able to distribute that code to other Xbox 360s, opening up a unique publishing avenue which will democratize game development on consoles. How about a game that can be played by multiple people on either XBox360 or Windows PCs together? How about revenue sharing or actually selling your games through xbox live? Can Windows Forms be used, or XAML, and if so, is there just a new presentation layer that represents standard buttons, etc, making more game like menus straight from windows.forms code? I'll definitely look around the web for answers, but I figured I'd post them as I watched up the video. I'd love any remarks you can share, or thoughts on future developments? ﻿just so the crew knows, i like the new host. it's nice to have someone younger. but nothing against you, charles. Let me just say that you're going to be blown away by what can be done with this - and at 1080p, no less. ﻿How much of the .Net framework is supported in broad terms? 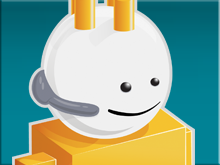 .Net 2.0, 3.0 compatibility? As you'll learn in more detail from the next video in this series, it's a modified version of the .NET Compact Framework v2.0. There isn't really any good reason to include 3.0 - WPF? WF? WCF? While I can see WCF being of use, the infrastructure isn't there to support it. ﻿Will you be able to make networked games - ie remote multiplayer? They're still working on that. It's a much more complex issue than it seems. There are security issues, for one thing. ﻿How about a game that can be played by multiple people on either XBox360 or Windows PCs together? I don't know if XNA will include this kind of functionality, although any software problem can be solved through software. That said, the 360 team would need to provide a bridge between XBL and the Rest of the World. While devs don't have to use XBL to create networked games, it's clearly the preferred method. ﻿How about revenue sharing or actually selling your games through xbox live? This is another issue that's being looked at. The biggest problem is the potential for an overcrowded marketplace with loads of very mediocre games. This is another issue you'll learn more about in the next video in this series. Just keep in mind that XNA is brand new - it's something that went from idea to product in six months. That's an amazing turnaround, especially given what was accomplished. I think the major goal for the first release was just getting things to work. Other aspects XNA, I'm sure, will be worked out as the product grows and the team figures out how customers want to use it. No XAML support. It doesn't mean it couldn't be implemented, but it isn't there right now. Also, I'm pretty sure there's no support for Windows Forms. The game development world is so completely different from LOB apps - there's a lot of DIY work involved. Many of the questions you asked are either answered or discussed. The teams behind XNA don't actually know the answers yet, which is why things are up in the air. This project came together so amazingly fast that they didn't stop to deal with peripheral issues. Job number one was to get XNA working. But I can assure you (and you'll hear it directly from someone deeply involved with XNA) that they're thinking about every issue you've raised (except, perhaps, things like XAML support). So, yeah - keep watching. I think this is one of the coolest things to have ever happened in the world of console development. I don't think any other company has ever offered access like this to the system, and it's also probably the best opportunity ever presented for people to learn game development. The skills put to use with XNA can translate directly into real experience and real jobs. I'd personally like to see something that has never existed before: A console shareware scene. I'd love to see shareware come back. Software written out of a love for the craft, and paid for by the people who appreciate the results. XNA is going to change console game development, and therefore the console game scene, in some huge ways that I think people aren't fully realizing yet. When you can put together a game on your own and then release it without having to be some giant dev shop, your freedom to work with truly innovative game ideas goes through the roof. I'll bet that some of the best, most interesting console games ever made will come out of XNA. (Can you tell I'm excited? ). A critical question you didn't ask is about application development i.e. as opposed to game development. Imagine something like Ventuz (www.ventuz.com) running on XBox 360 or some other presentation/visualization software. Imagine data analysis/visualization applications. The key thing is that XBox hardware is pretty powerful and cheap as chips - not to mention portable too. I always got the impression they would be against LOB apps on the XBox because they lose money on every console sold, and have to recoup it in some way through channel sales and licensing agreements with the games vendors. Can someone elaborate on this please? 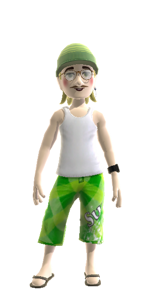 "Q: Can I create non-gaming applications (such as a Media Center/Player) with XNA Game Studio Express? A: On Windows this is possible, but the initial release on Xbox 360 is tuned to writing games. This is an area we are actively looking to the community for feedback on the types of applications they want to write for their Xbox 360. " I found this in the FAQ but would still like some elaboration. Also they are discontinuing MDX so you would assume XNA is the "replacement" as they are talking about offering help for transition. I suspect they will have a rule that non-games or possibly even proprietary games (that can't be published through some public mechanism for IPR/privacy/confidentiality reason) are Windows-only. I was wondering if anyone could give me some advice, I am studying for a programming related degree at the moment, hoping to get into 3d engine/game development. I am quite confident using c# and over the last couple of months I have been building a hierarchical engine in vs 2005 c# using .net 2.0 framework and the latest DirectX SDK. I have been reasonably successful with the engine, Should I throw in the towel with the pure c#, direct sdk or should I start using the XNA? I also have an additional problem. I have found a problem when using the built in lights in the directx sdk. At the moment I am using an .fx shader effect to light my textured meshes. However I am having to read into the shader the light positions from a wrapper I have written for the directx light. I am sure I'm doing something wrong and directx should be doing all this for me. If anybody could point me in the right direction it would be greatly appreciated. tranbonium wrote:﻿How about a game that can be played by multiple people on either XBox360 or Windows PCs together? Didn't I see something from this years E3 about being able to play multiplayer games across XBox360 and Windows Vista with players not even being able to tell what platform the others were using (except that the people using PC's would be kicking *** over the people using XBox's of course). Maybe I'm misunderstanding what you meant there, but I know I saw a little bit of info on XNA more than a year ago (even back in 2004 if I remember correctly). I'm not so much interested in the console side of things myself, but I've been interested in game development for a long time but never got beyond making a few small games myself. I'm really excited to see how XNA is coming along and I think it's just the thing to help me get started on something a bit bigger. hey im REALLY new to all this XNA stuff, so i have a question to all of you. what do you all recomend that i study up on in advance so i am ready and (kinda) know what im doing when going to create some XNA stuff. Thank you all in advance! what do you all recomend that i study up on in advance so i am ready and (kinda) know what im doing when going to create some XNA stuff. http://creators.xna.com is a good place to look around at some examples of how other people are doing things.